On the rare occasions I wear my hair down, I usually have a black rubberband wrapped around my wrist just in case I want to put it up. So, when I discovered that a neighbor of mine recently launched a line of chic bracelets that double as hair ties, I took notice. After all, these are no ordinary hair ties; they're Cartier Love bracelet compatible! The rose gold disk, above middle, is my favorite style, and it's $18. Check out the others, featuring green onyx, rose quartz and tourmaline here. 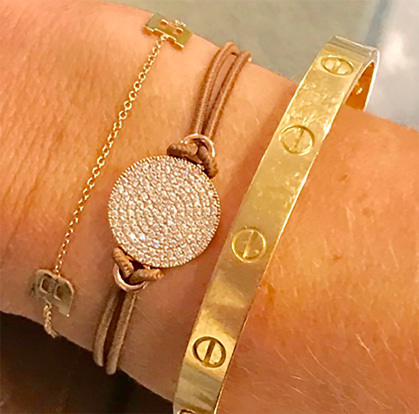 Love the "B" bracelet, do you know who makes it? Tx! Where did you get the letter bracelet behind the hair tie?? These are amazing! Just ordered 3. Plus- what a cute gift! love. is yours the xs/s or m/lg?